Matar paneer recipe (Mutter paneer masala recipe) – This is one of the popular paneer recipes from Punjab. 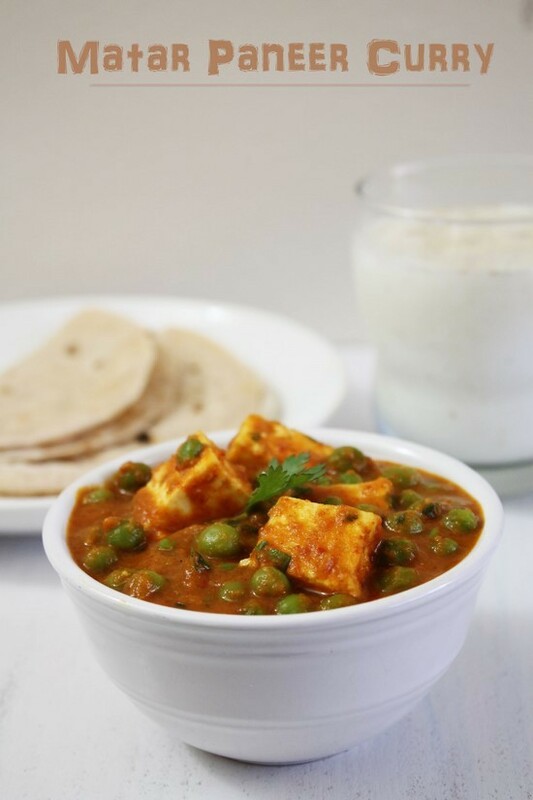 Here paneer cubes and green peas are simmered in spicy onion-tomato gravy. This matar paneer curry is very simple and easy to make. Paneer and peas curry is popular North Indian recipe that you find in almost all restaurant menu. Many punjabi households make it at home on regular basis as well. Even though I am not punjabi, I do make it once a month because green peas in any form are hubby’s favorite. This is one of the paneer curries that I prepare at home very often. Because this is HEALTHY and LIGHT recipe unlike other paneer curries e.g. paneer butter masala, shahi paneer, malai kofta. Meaning this is not restaurant style version but it is home-style recipe. I have made this matar paneer gravy without adding any creamy or heavy ingredients so it is very healthy and homey. To make restaurant style matar paneer add 1-2 tablespoons of heavy cream at the end. Alternately you can add cashew nut paste as well. If you are not calorie conscious then shallow fry or deep fry the paneer cubes. It adds more flavor to the dish. If you are vegan then use Tofu instead of paneer. 1) Heat the 2 teaspoons of oil in a pan on medium heat. Once hot add cumin seeds and let them sizzle. 2) Saute ginger, garlic and green chili for a minute. 3) Add onion and sprinkle some salt. 4) Cook till they becomes soft and translucent. 6) Cook till they becomes little soft. Let it cool a bit. 7) Meanwhile boil the green peas in microwave or pressure cooker. How I did: in microwave safe bowl, add peas, salt and 2 tablespoons of water. cover it and cook for 2-3 minutes or depends on your microwave. Here I have used frozen peas, so I microwaved it for few minutes. If you are using fresh peas then it takes little more time to cook. 8) Now onion-tomato is cooled. Grind into smooth puree. 9) Heat remaining 1 tablespoon of oil in the same pan. Once hot add prepared paste and saute. 10) Cook till all the moisture evaporates. If it is spluttering too much then partially cover the pan. Do stir in between. it starts to leave the sides of the pan and oil will ooze out. 11) Add turmeric powder, coriander powder, red chili powder and garam masala. 12) Mix well and saute for a minute. 13) Add a cup of water or more or less as per your liking gravy consistency. 14) Stir and let it come to a boil and simmer for 2-3 minutes. 15) Add boiled peas and cubed paneer. 16) Mix well and simmer for 3-4 minutes so peas and paneer absorbs the flavors. 17) Finally sprinkle chopped cilantro. 18) Stir gently and Serve. If not serving right away then keep matar paneer covered till the time of serving. Serving suggestion: Mutter paneer masala can be served with roti, paratha or naan. It can be served with plain rice as well. I make gravy little thinner if I plan to serve it with rice. Have some kachumber and salted lassi or masala chaas on side to make it a meal. 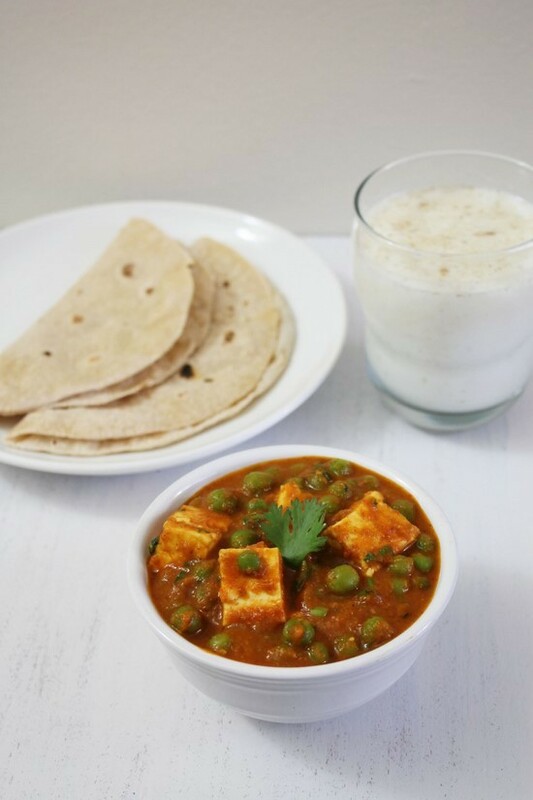 Matar paneer recipe (Mutter paneer masala recipe) – This is one of the popular paneer recipes from Punjab. This is the home style recipe hence healthy. Heat the 2 teaspoons of oil in a pan on medium heat and add cumin seeds. Once they sizzle, add ginger, garlic and green chili and saute for a minute. Then mix in onions and little salt, cook till they becomes soft and translucent. Now add tomatoes and cook till they becomes little soft. Once cooled grind into a fine paste. Meanwhile boil the green peas in microwave or pressure cooker and keep it aside. Now add turmeric powder, coriander powder, red chili powder and garam masala, mix well and saute for a minute. Add water to make gravy consistency and let it simmer for 2-3 minutes. Now mix in boiled peas and paneer, let it simmer again for 3-4 minutes. Loved it , awesome recipe. LOVEEEEEEE your recipes!!! I tried sookhe kale chane yesterday and today I this! it was a hit in my house!! thank you so much for such tasty and easy to follow recipes!!!!! happy to see that recipes came out good. thank you for the feedback. I love restaurant style matar paneer. I’ve never liked green peas & won’t eat them any other way. Can you tell me what kind of peas to use? English peas? I’m pretty sure it’s not season for them to be fresh. Will frozen work? Yes I use the frozen sweet peas. it works fine.